Visiting Phuket has been on my list of places to see for over six years now. Even though most travel guides talk about the over-commercialization of Phuket, I still wanted to see what Phuket is like for myself. While Phuket was fun to experience at first, I started to feel drained after four nights in Patong Beach. There is a lot of the hustle and bustle, and the area is noisy, loud and crowded all the time. 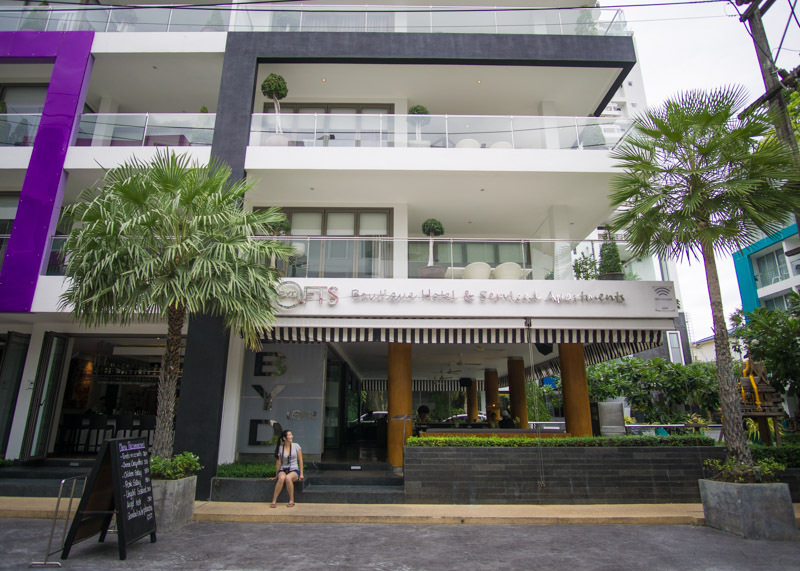 Just when I was feeling exhausted from Phuket, BYD Lofts Boutique Hotel & Serviced Apartments came into the picture for the last few days of our stay in Phuket. No joke, this place is my savior, and it was such a beautiful place to unwind. Whatever bit of homesickness I felt for my Toronto condo was gone after staying at this hotel. 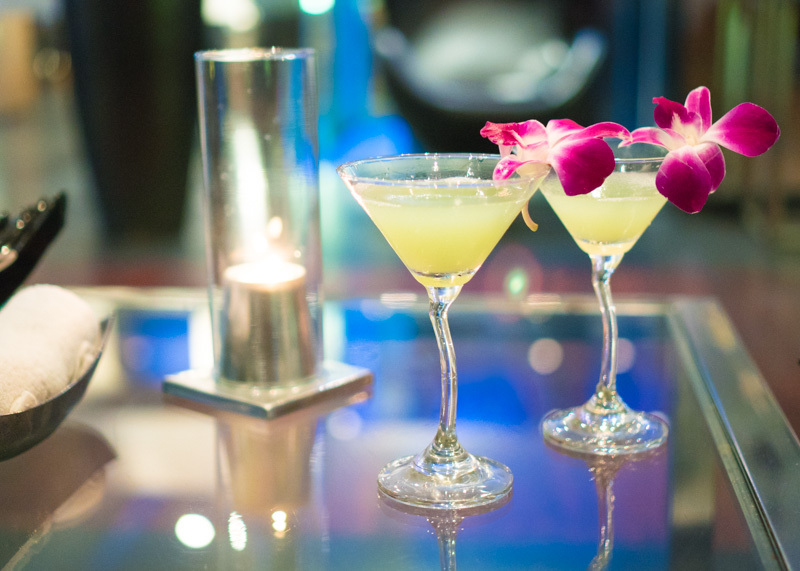 What’s the ambiance like at BYD Lofts Boutique Hotel & Serviced Apartments? 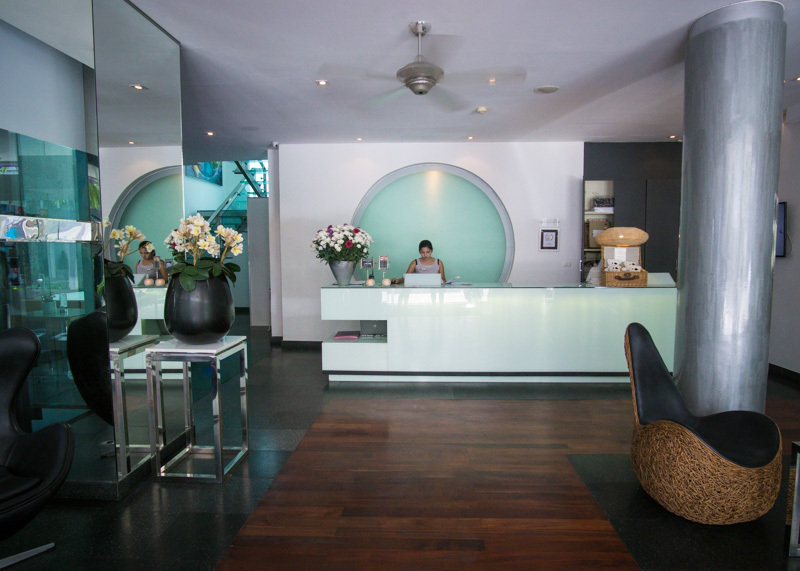 This Phuket accommodation is modern, beautiful and made me feel at home. 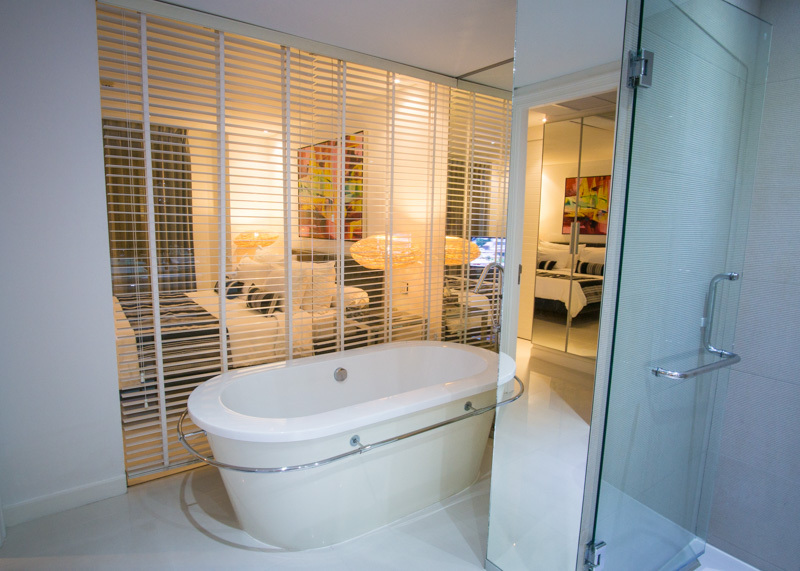 Indeed, it has a boutique hotel feel, but it also felt like living in a condo in Toronto! 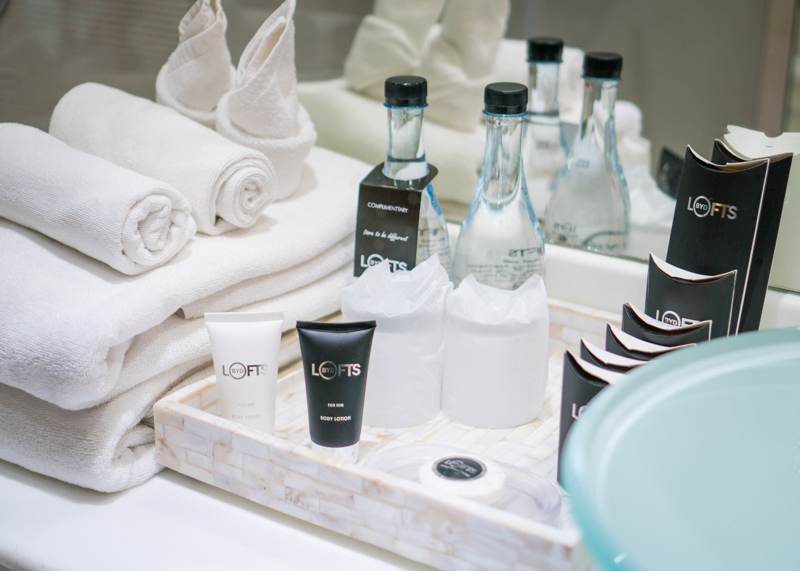 BYD Lofts did a great job creating the feeling of being in your own home with the quality service of a hotel. At any given time, you can call reception to help you with your requests. 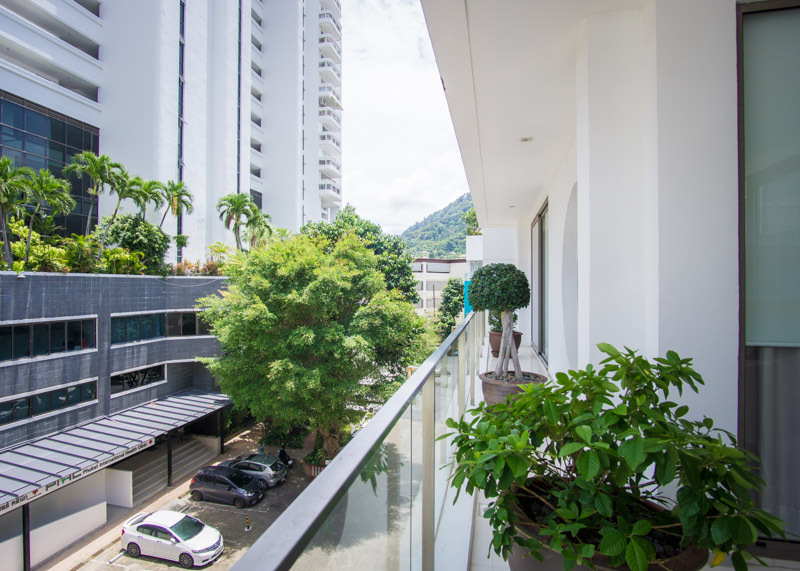 The hotel has 46 serviced apartments spread over four buildings. 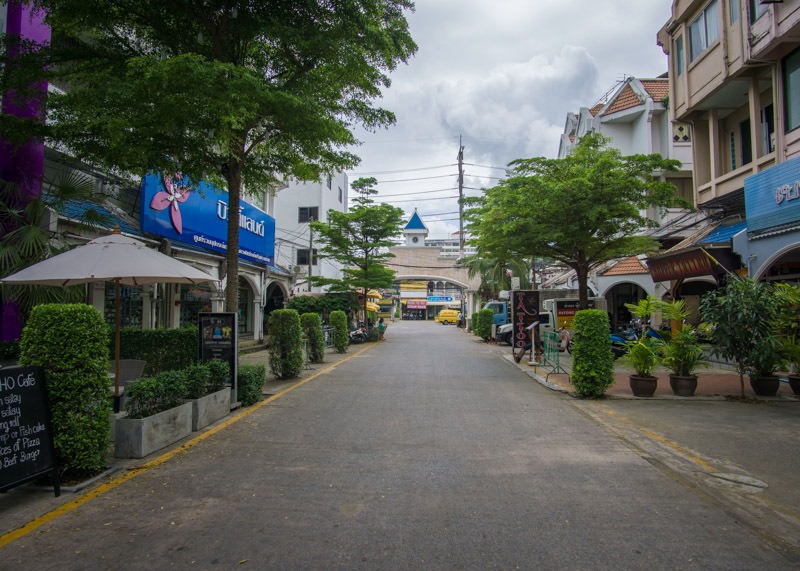 The area is tranquil and made us feel like we were in the residential area of Phuket. 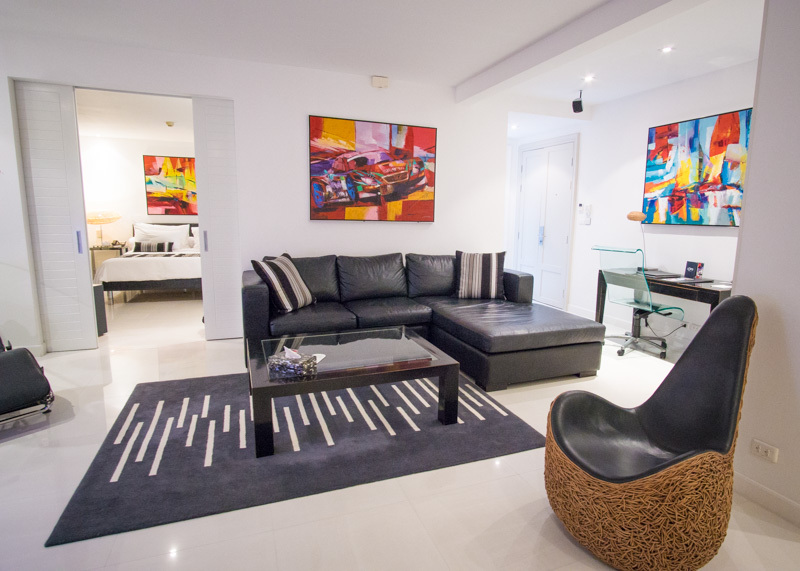 Serviced apartments are a hybrid between a hotel and an apartment. You get all the features you’d expect as if you were in your own condo, except you get all the services of a hotel. Score! 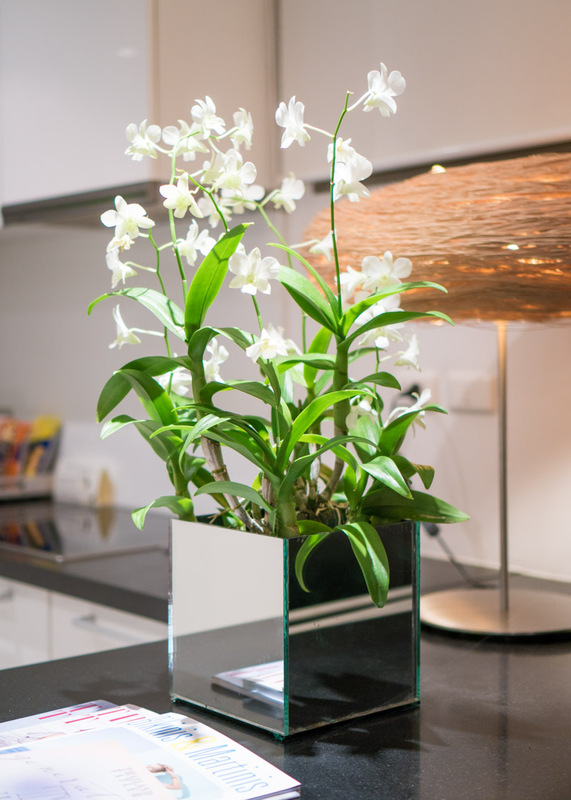 Think, beautiful plants around your home without the responsibility of watering them! And not having to make your bed or taking out the garbage! Not going to lie, serviced apartments are new to me, and I never heard of this concept before BYD Lofts. 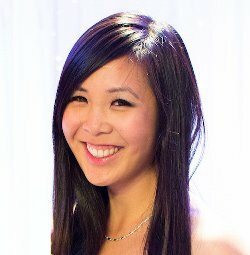 I thought I might be the only one new to this idea, so I asked some friends (simple market research, haha!) and realized I was not alone in this boat. They too were unfamiliar with serviced apartments and was curious to learn more. 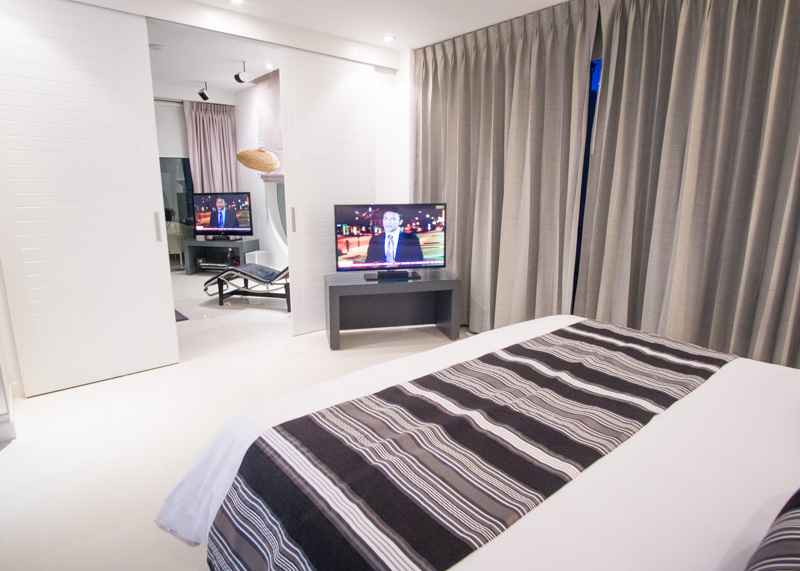 There is a lot more space in serviced apartments compared to a hotel room. 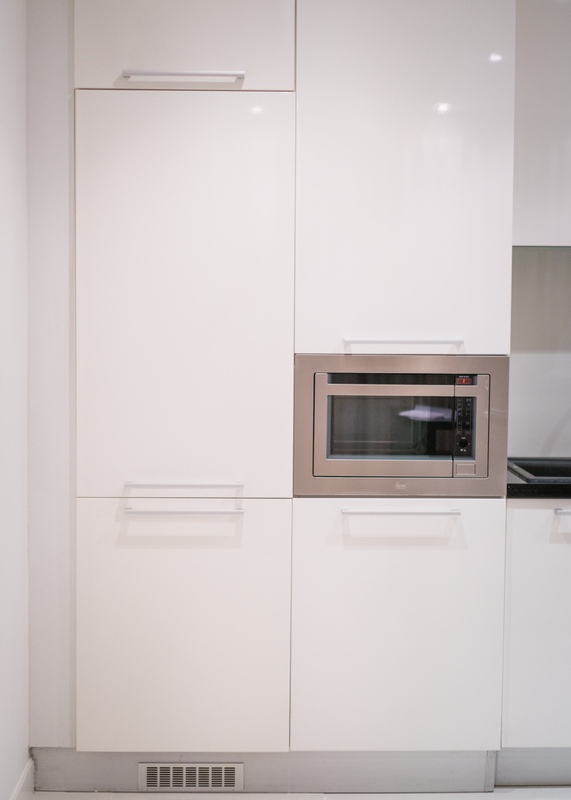 Most serviced apartments also come with a kitchen and living room. The kitchen makes it ultra-convenient for those who want to cook meals or save money from dining out. In our case, we bought a watermelon, and I was dying to cut into the fruit. Try using a Swiss army knife to cut open a watermelon while laying it on a side table in a hotel room. For those who know me back home, I try to prepare my own meals, and I read the ingredients on all the labels! Making my own meals hasn’t happened much during my trip because I can’t read in any other foreign language. These days, I’m relying on photos to figure out what I am eating, which has been a pain point for me. As well, we’ve been eating out A LOT, and it’s starting to affect my health. I’m pretty sensitive to MSG and just my luck, Southeast Asia LOVES MSG in their food. They either put in a lot of MSG or put in tons of salt and sugar to enhance the food. My sensitive body hates too much salt, so it was great to be able to eat meals in a space where I can (temporarily) call my own. We loved our Phuket accommodation so much that we created a video tour of this beautiful boutique hotel. It’s kind of funny (scary?) how the furnishing of this room reminded me of our Toronto condo. Black leather sofa, floor lamps, and clean white walls dominate the unit. Beautiful paintings added a splash of colour to the walls. Staying in a loft is much more comfortable than a hotel. You can cook yourself a meal or use the microwave to heat it up. 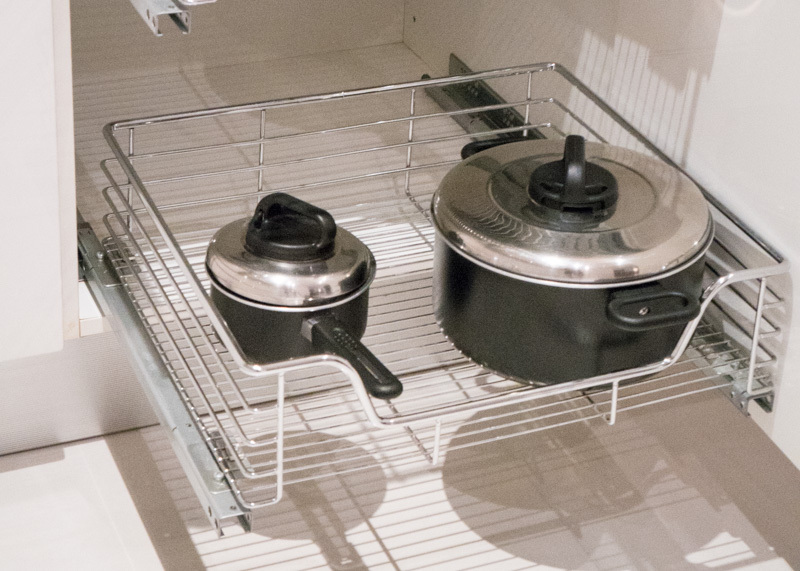 You have access to actual utensils and cutlery with space to eat it. Our room was over 1,075 square feet, had tons of closet space and had everything you would normally have at home. Having all this space was pure luxury, given that we were on the road for over a month at this point of our One Life Changing Year. Look, I can watch two TVs at the same time! Depending on my mood, I could choose to write at the desk or on the sofa. I usually ended up on the bed or the lounge chair. I loved how there were lots of windows in our unit, allowing for lots of natural lighting during the day. Of course, getting a well-deserved afternoon siesta was easy too, thanks to the opaque curtains. The living room had more than enough space for the two of us. There were two LCD TVs in our unit, with an all surround sound system. It’s been over a month since I’ve been in a full sized kitchen! 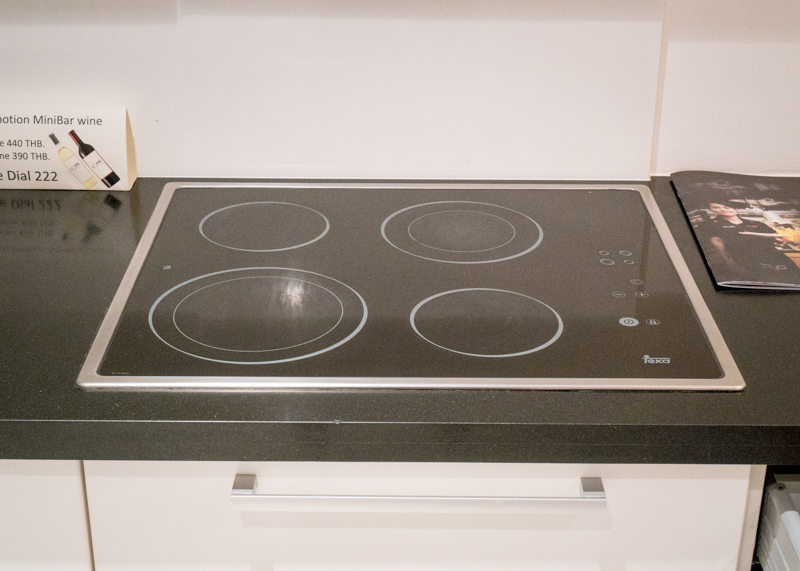 A stovetop to cook home meals on! Pots and pans in case you want to cook! 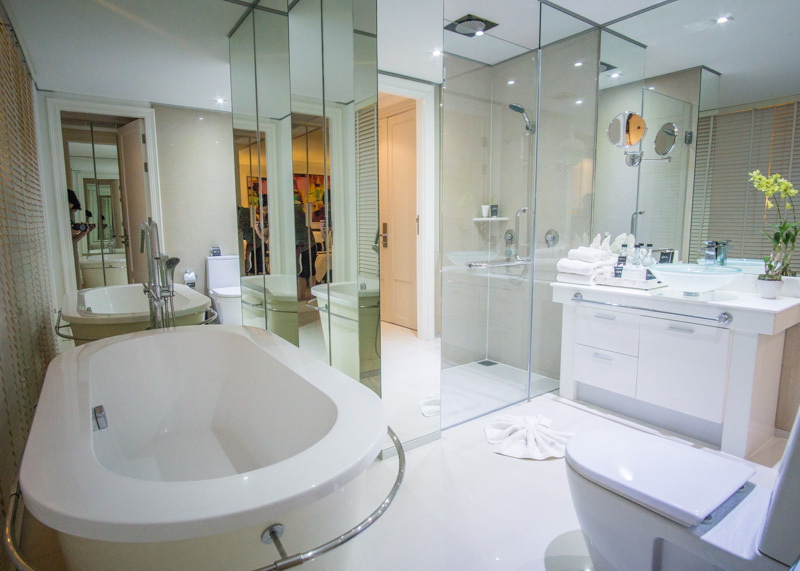 The bathroom features all around mirrors, making the room feel even bigger and modern. Hey look, there are three Nancys! This balcony is huge and extended around the unit! Our balcony was enormous and encompassed one side of our unit. 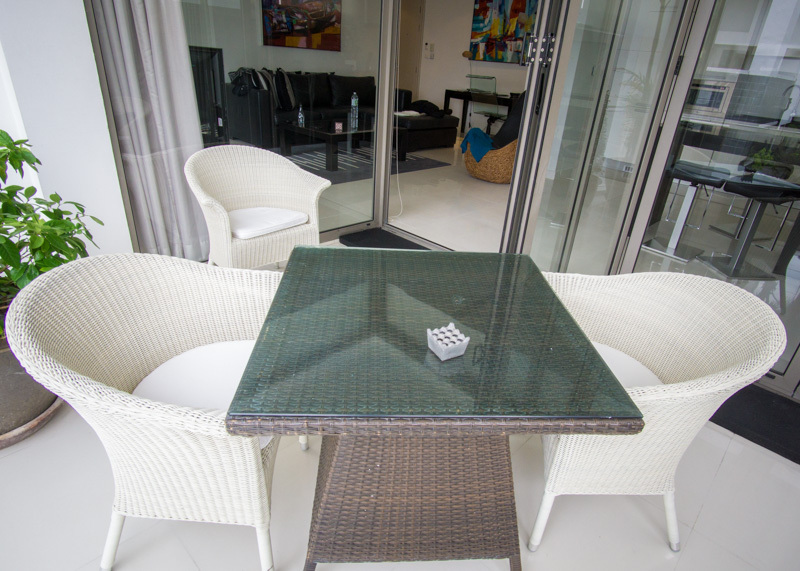 There were two access points as well: one from the dining area which had a patio set and one from the bedroom. 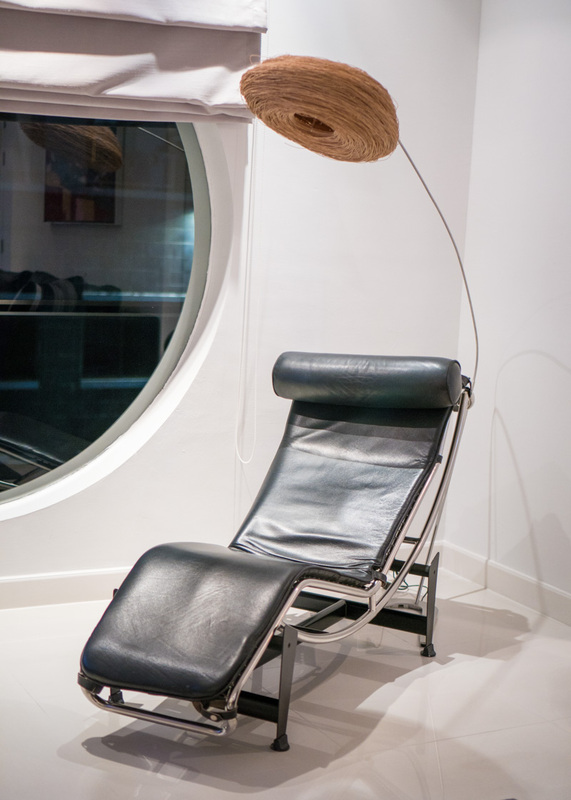 What we loved most about this hotel are the little details that went into creating a pleasant ambiance. Not just in the unit itself, but also in the service. 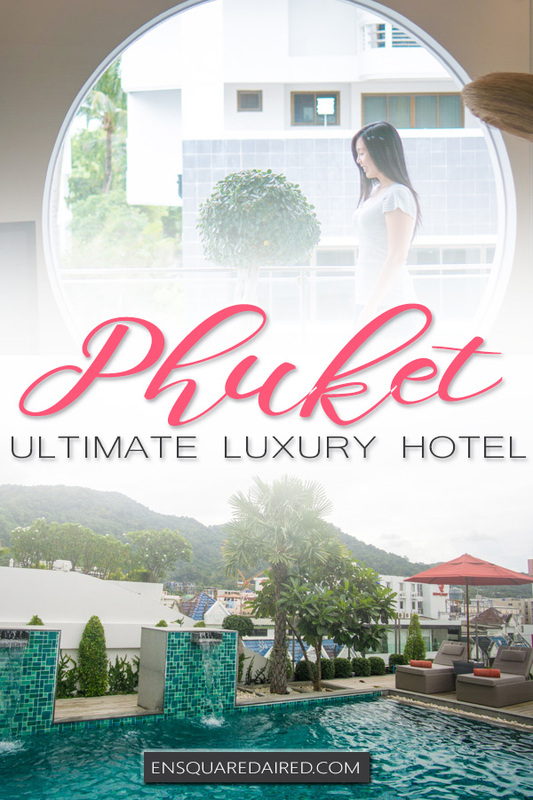 This Phuket accommodation also did very well in brand execution in an eloquent manner. 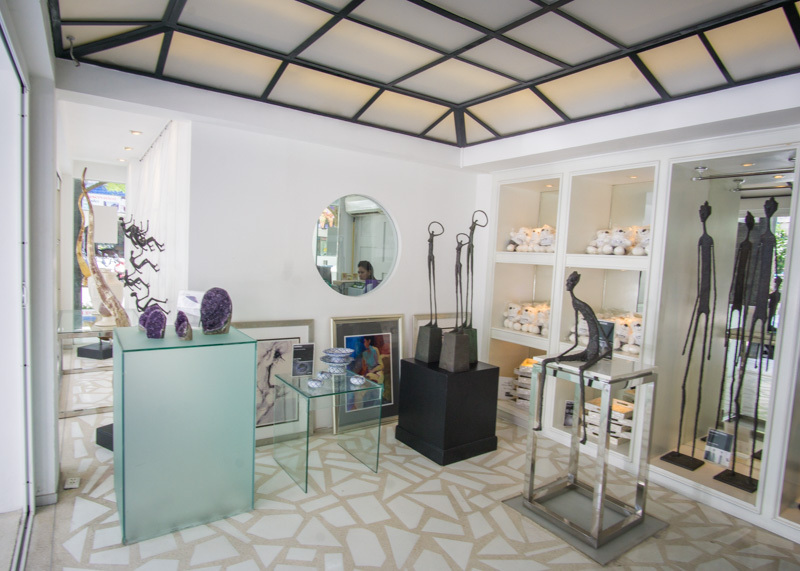 Every little aspect relating to their brand stays consistent with their chic vibe. For instance, we entered our room to find a plate of fruits (with dragon fruit! my favourite!) and a bottle of wine. 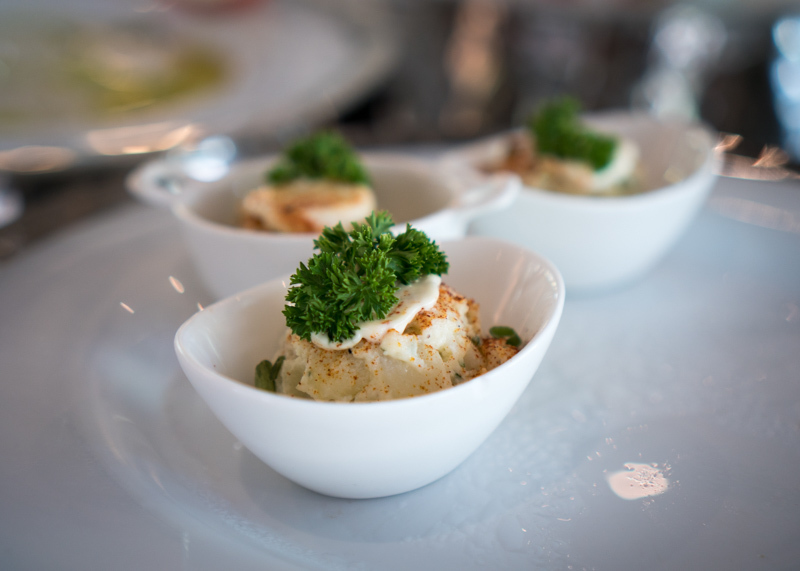 How’s that for a potato salad? 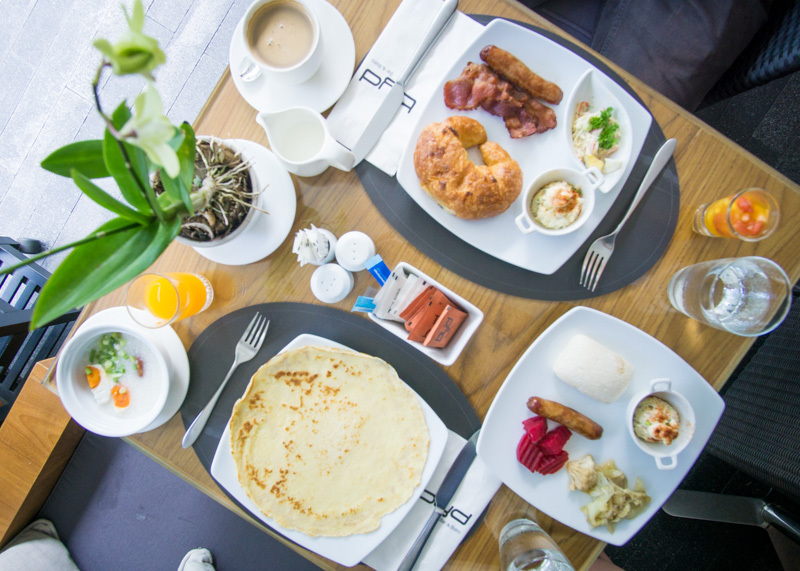 Breakfast is between 7:00 AM to 11:00 AM, which was awesome for us and felt more like brunch for us (we are late eaters). I was quite impressed with the selection of choices available for guests. 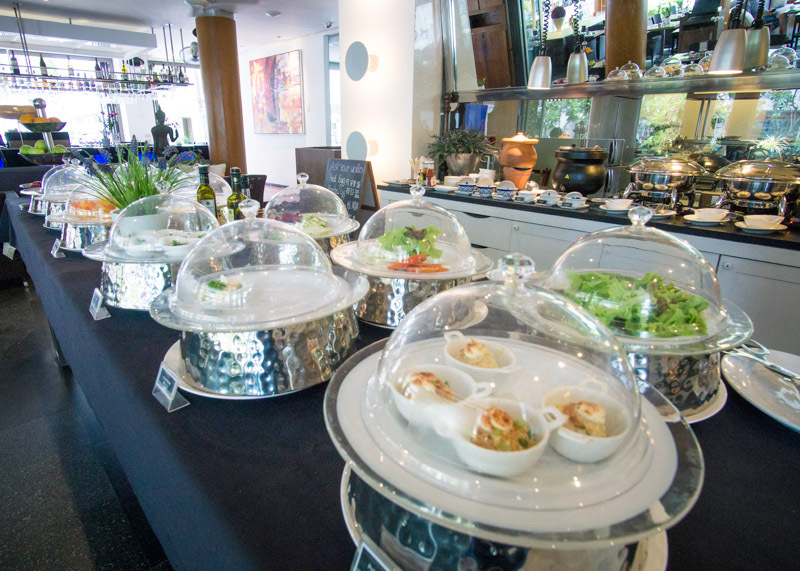 The selection included fruit, salads, cereal, bread, cold cuts, congee, fried rice, and other hot dishes. You can also ask for eggs or pancakes. The staff at BYD Lofts are professional and attentive. Whenever we had questions, they were there to help us. 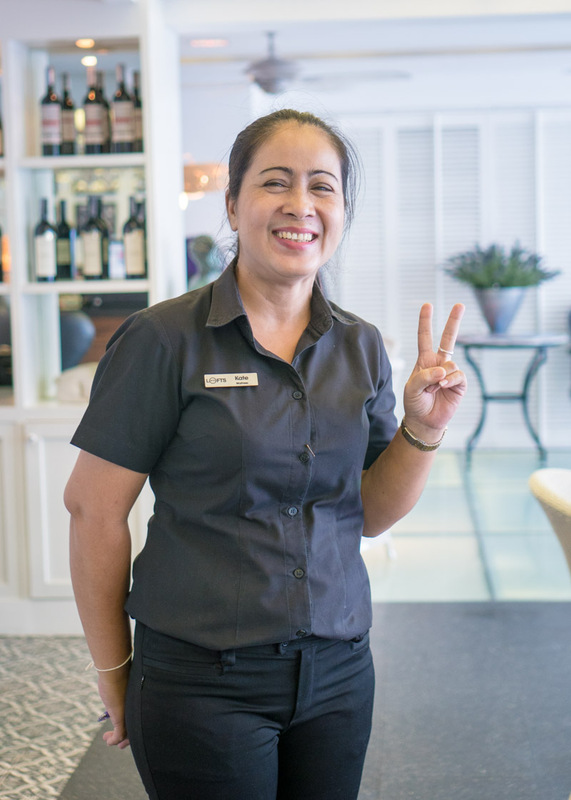 Kate was one of the staff members we met during breakfast at BYD Bar & Bistro that made our stay memorable. Kate was very attentive and very kind on our first day at breakfast. I thought I would see her again for the duration of our stay and was sad when I did not see her the next day. It wasn’t until we wandered into the Soho café that we ran into her! It turns out, we met by chance as she was only temporarily covering for BYD Bar & Bistro on the previous day! Kate was so happy to see us and mentioned how she was looking out for us during breakfast. She saw us eating from across the street but could not get our attention because we were far from her. The next day, we kept an eye out for her during breakfast. Once we saw her, we started waving like maniacs to her from across the street, to which she responded with joy. Why yes, I’d like a luxury transfer to the airport! 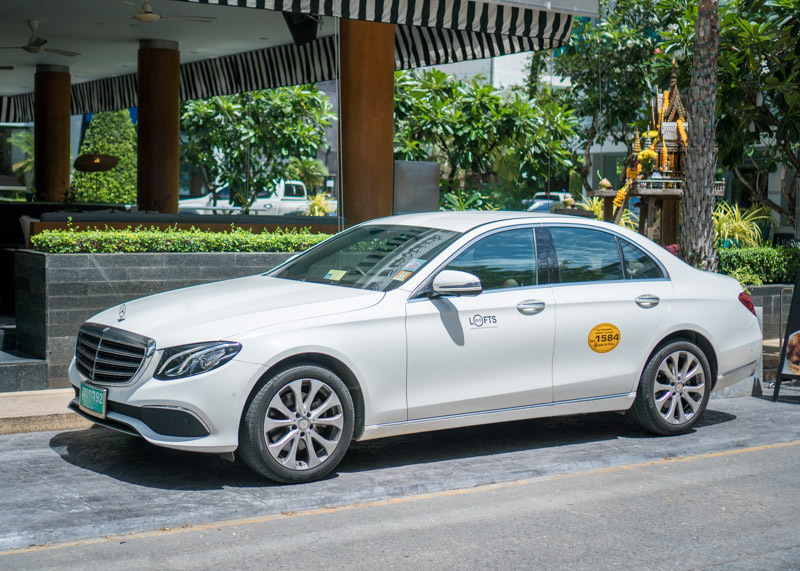 BYD Lofts offers airport transfer by their beautiful Mercedes Benz. Given our previous taxi experiences, I wouldn’t hesitate to book an airport transfer with the hotel. The hotel also offers in-room spa treatments. How awesome is it to get a massage right before bedtime without having to move too far from your bed? This place is a like a little paradise within the chaos of Patong Beach. This location meant we were away from the crazy Patong life and the noise from the late night partiers. Believe me, we stayed in another place in Patong before BYD Lofts, and I can’t tell you how many times I heard motorists revving their engines at 3 am! Do they not value sleep? BYD Lofts is spread over four buildings and has two restaurants and two swimming pools. 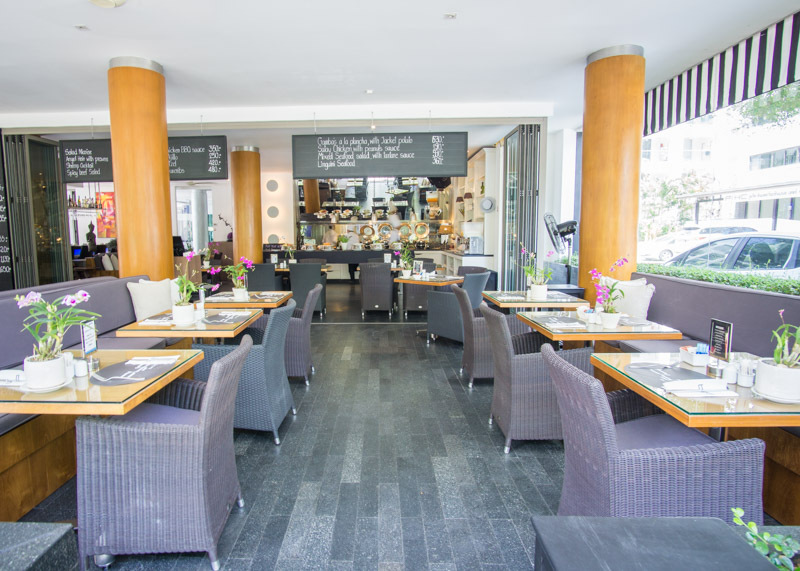 Their main restaurant is BYD Bar & Bistro. 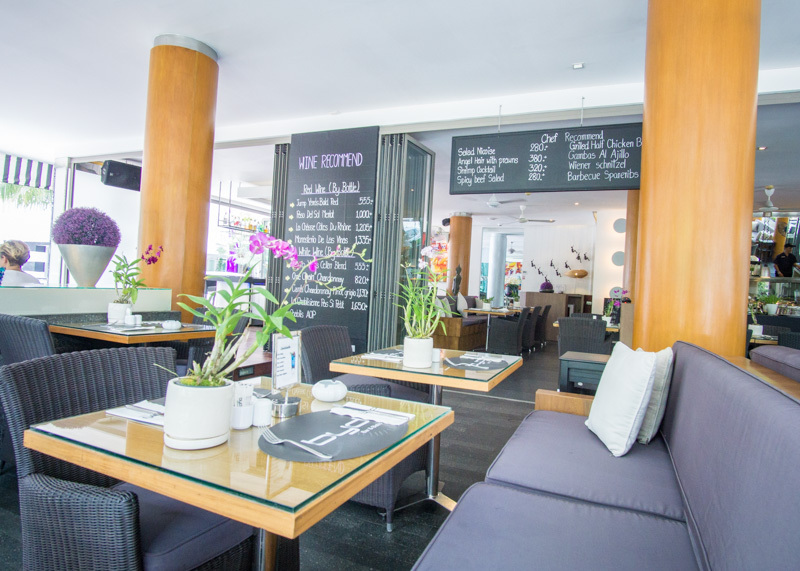 The Soho café has an upscale New York ambiance. 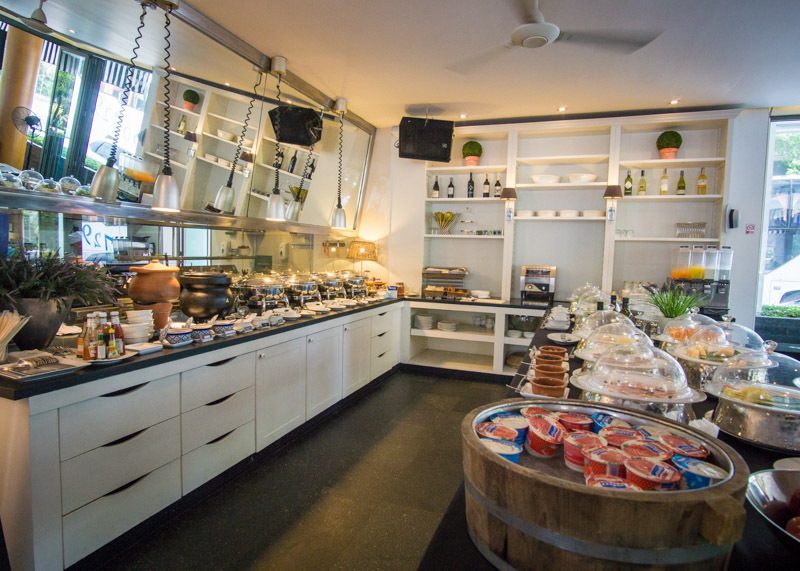 This Phuket accommodation also has Wine Connection on its premises. 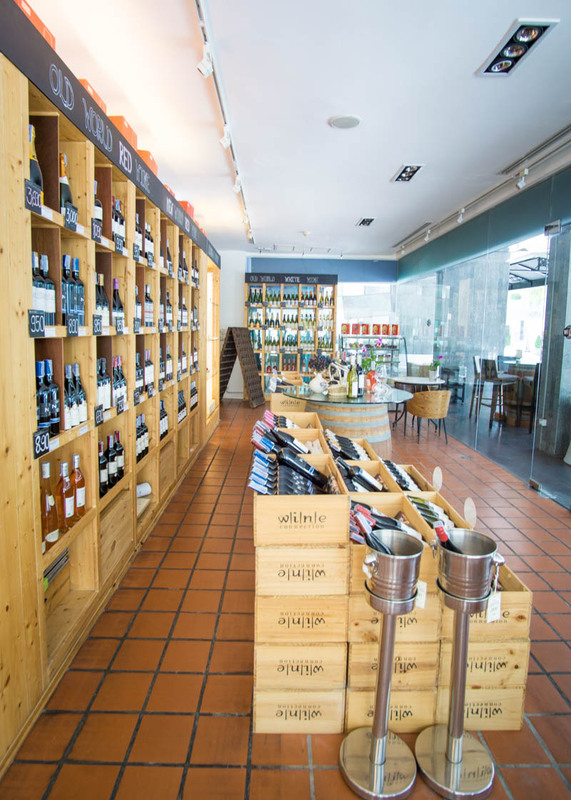 This cute little shop carries over 1,500 bottles of wine at wholesale prices. 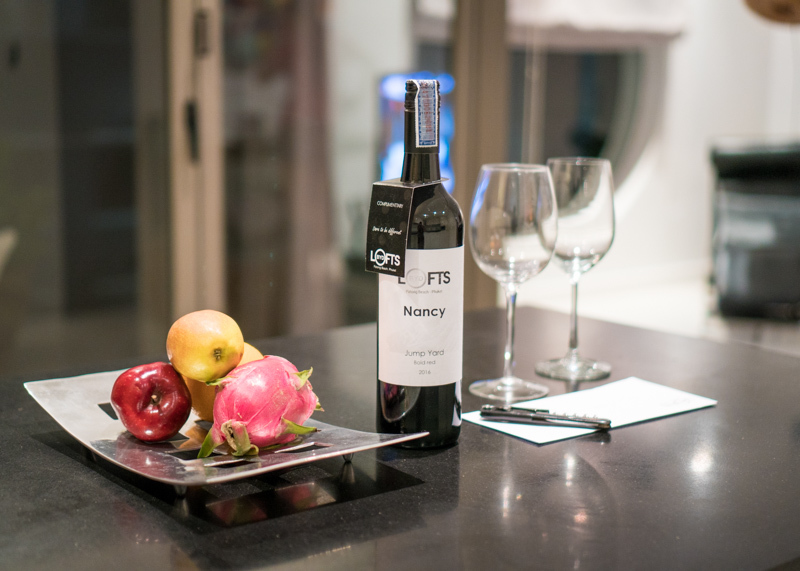 You can buy wine and enjoy it at the shop, or bring it back to your beautiful room and enjoy as if you were at home. 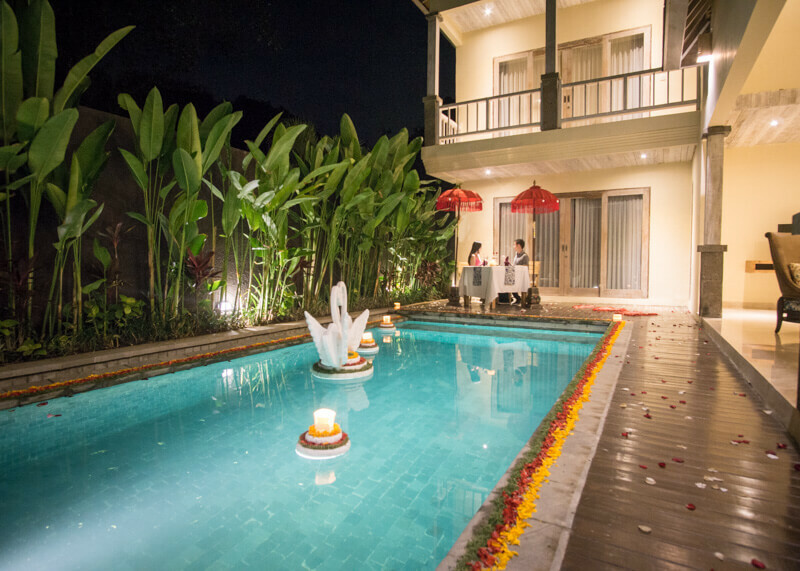 There are two swimming pools where guests can visit. Both pools are gorgeous and great to relax and unwind. 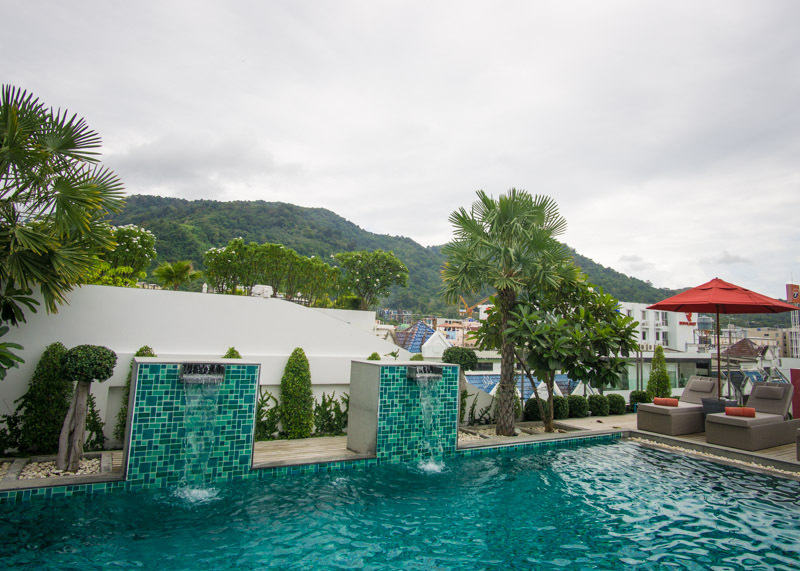 You definitely would not feel like you were in Patong beach in either of these locations. I loved the artwork that surrounded this hotel. 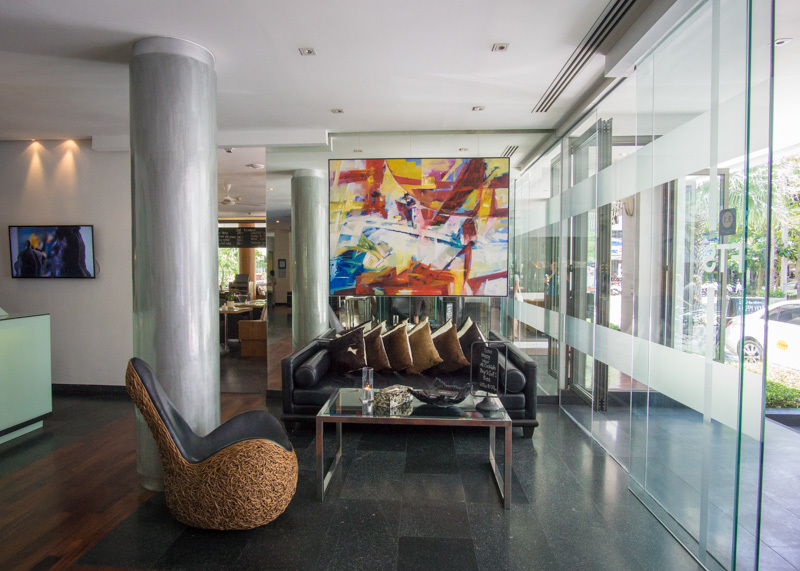 The artwork comes from Khun Suthirak, a Thai artist whose signature style involves bright colours and layers of paint. 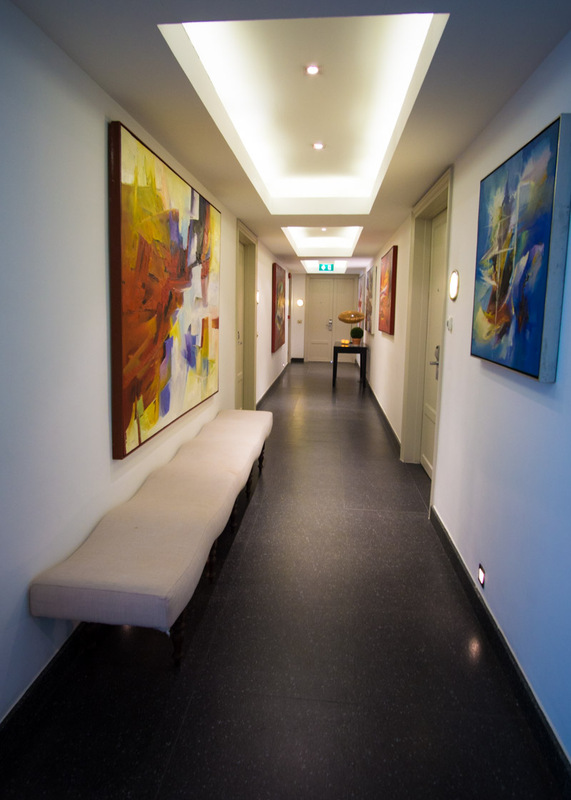 The artwork is very abstract and brings life to the white walls in this hotel. We went through every floor in the main building of BYD Lofts to admire all the paintings on the wall. Looking at the art made me think of my friend whose paintings are displayed in some Toronto hotels. Each painting had a description that went well with each painting. Here are snippets of some of my favourite descriptions. 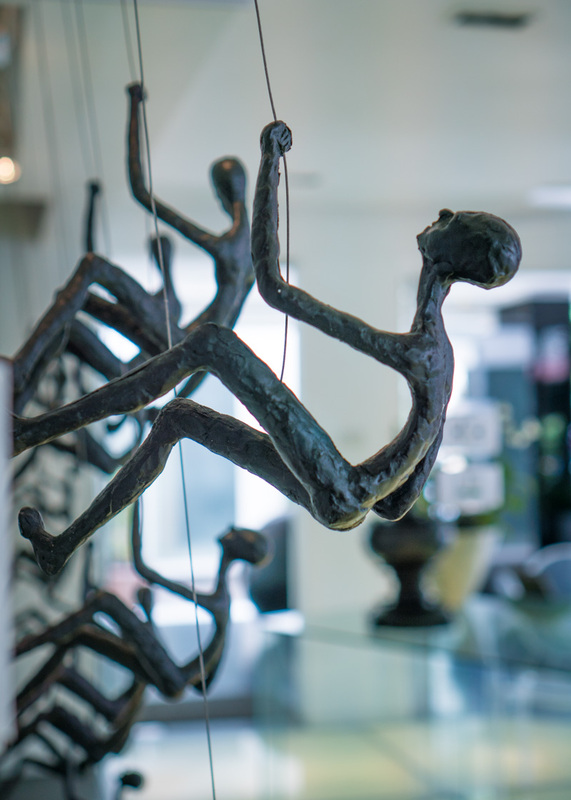 This hotel also displays impressive art called Climbing Men all around their hotel. Each man was in a different pose, but all are persevering to reach the top. There is a storefront where you can buy artwork from this hotel. 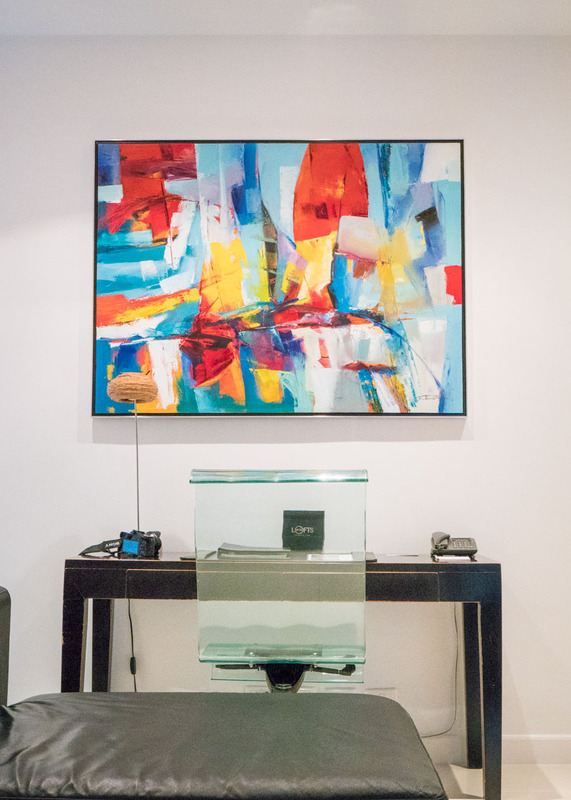 Artwork that you can bring home! BYD Lofts really impressed us, and it was hard for us to say goodbye to the place that we called home for a few short days. But Ao Nang was calling us, and we needed to continue on our year-long journey of slow travelling. Check them out on their website here for more information about BYD Lofts or contact them at info@bydlofts.com. This is a great review. Very informative. I like the style of the rooms and the amenities. Now that I’m aware of this place I’ll have to check it out. You’ll definitely like it! And from a price perspective, it’s quite reasonable for what you get! This place is out of this world. Wow! Lucky you! I love that lounge chair and breakfast never looked so goo?? the pool, come on, cherry on top! Is there anything this place doesn’t have//doesn’t handle like pros?!! Keep thse good findings coming girl! 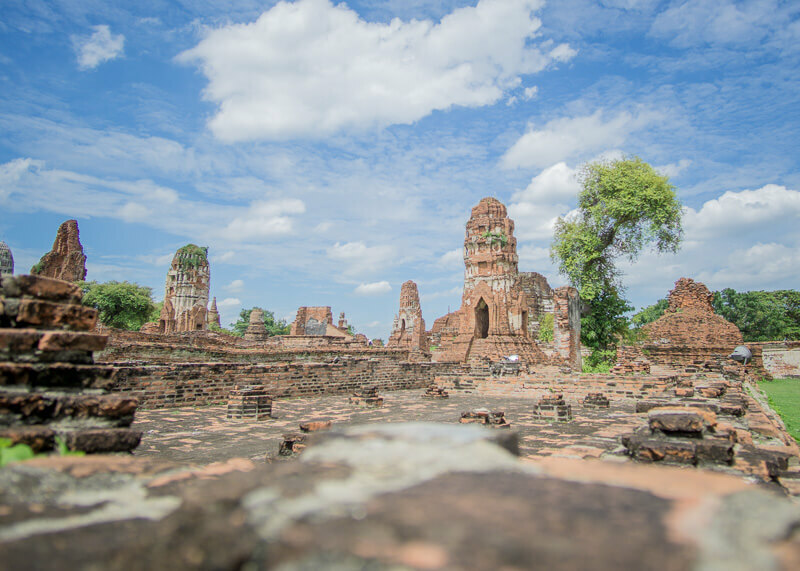 We travel to Thailand a lot so will keep this place in mind if we go back to Phuket. We always prefer to stay in apartments if possible. 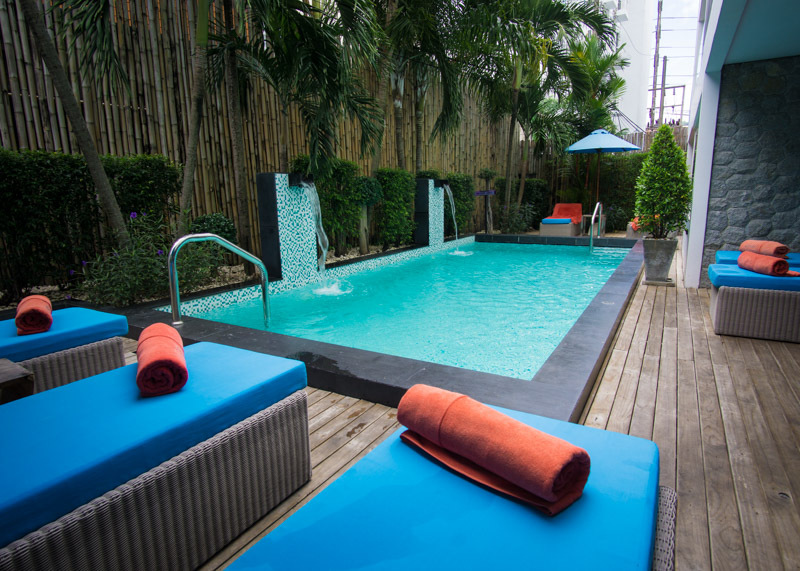 You will definitely love it if you travel to Thailand often and if you enjoy staying in apartments! ummm is it weird that I kinda want to live at this place?!?!?!? I love the design and asthetic. would be a nice refuge from traveling! I’m right there with the majority of your friends! 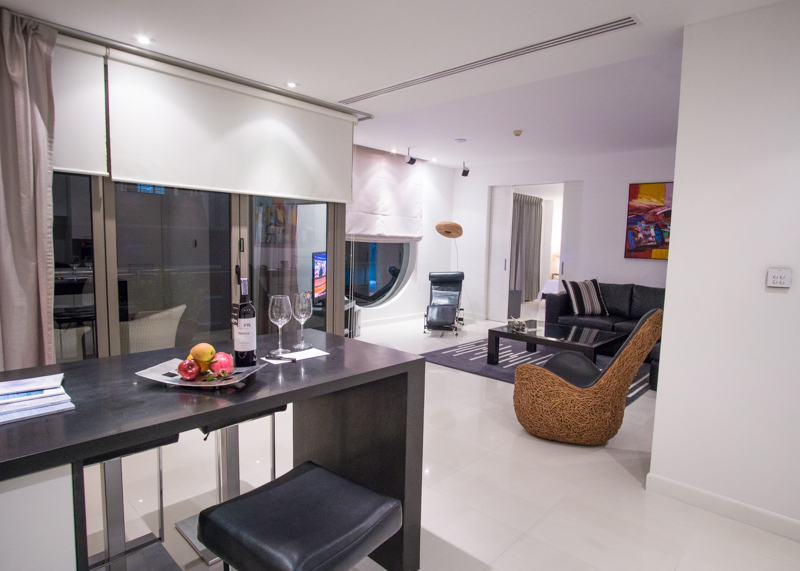 I had never heard of serviced apartments before, but they seem like the best of both worlds. The room looks beyond amazing, and I’m still trying to wrap my head around the fact that it’s actually a hotel. It looks like it would be someone’s home! I would love to stay here one day…I think I would enjoy it very much! Indeed, I felt as if I had the best of both worlds as well. 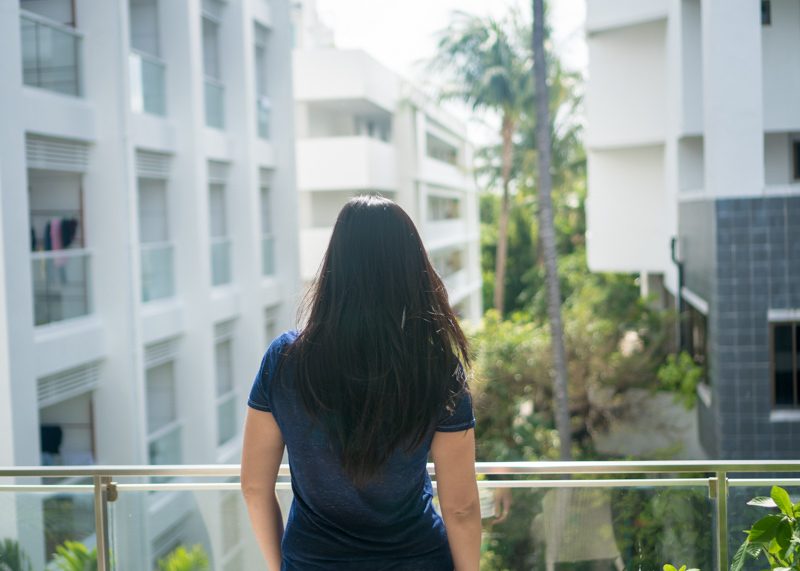 There’s nothing quite like venturing out to the busy areas of Phuket and being able to come back to a place that feels like home. I love love love this suite! I usually prefer staying in serviced apartments when I want to travel comfortably. 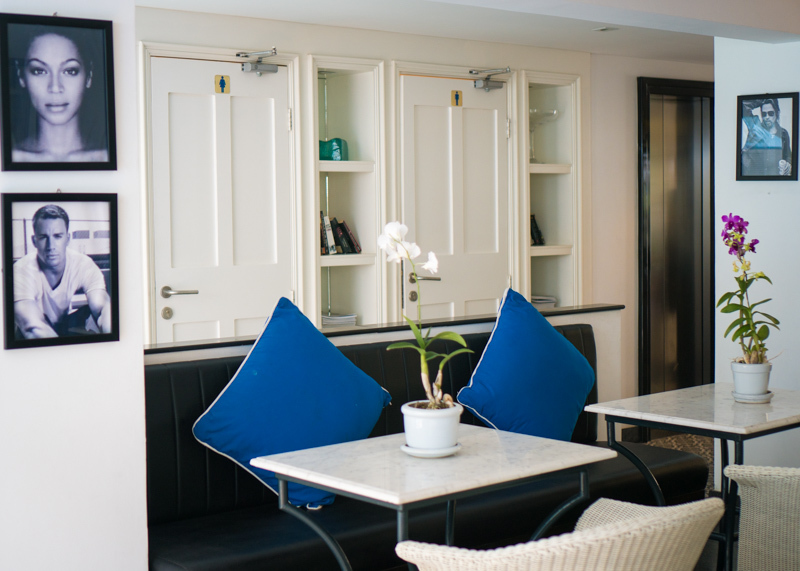 With the full kitchen, extra space and clean lodging, serviced apartments truly feel like home away from home. Actually better than home since I don’t have to clean and worry about keeping plants alive:) I’m bookmarking this hotel so I know where to stay in Phuket! Thanks for the information! 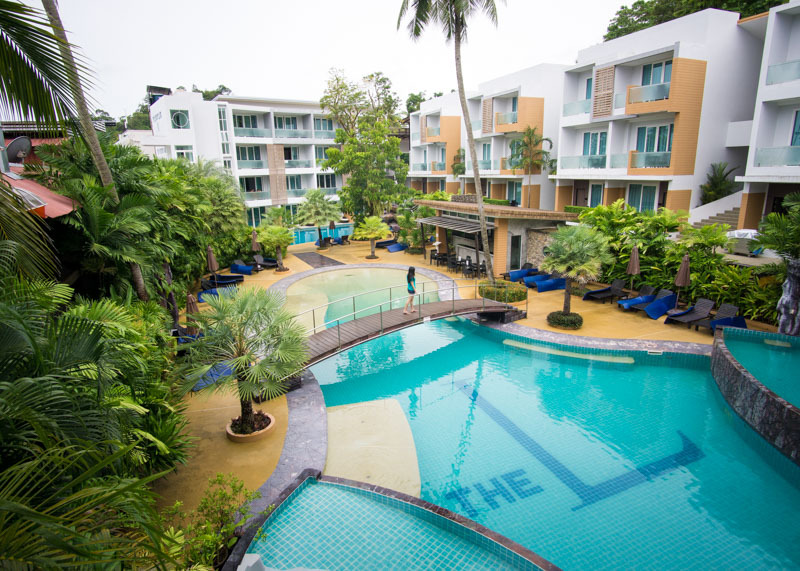 I am planning to travel to Phuket in coming late August, and your feedback has made me decided to go for this service apartment. I love this place…. soooo much, feel like home <3 (you know I was getting a bit frustrated in finding hotels in Phuket…) Btw, would like to ask which suite are you showing in the video? Is that deluxe suite or grand deluxe suite?